The theme for this year's AMD was prescient as the subject chosen was the need for a worldwide ban on asbestos. On June 29, just one week before AMD, the Quebec Government announced that funding of $58 million had been provided for businessmen developing a new asbestos underground mine in the town of Asbestos, Quebec.5 It was fortuitous therefore that Canadian Ban Asbestos Campaigner Kathleen Ruff had been invited to speak at the AMD event in Manchester; her presence meant that the developments in Quebec could be addressed by someone with intimate knowledge of the situation. Kathleen Ruff (centre) at the Manchester meeting, AMD 2012. To a packed audience, Ms. Ruff explained the background to the decision by the provincial authorities to hand over taxpayers' money for the asbestos scheme. Jason Addy reported that most of the delegates in Manchester were shocked by the news that the Province of Quebec was providing the bulk of the money for developing and operating the new mine. It was interesting to see, he said how the initial response of surprise quickly became outrage as Kathleen explained the political machinations and financial tactics of Canadian asbestos stakeholders like Bernard Coulombe and Baljit Chadha. Knowing that most of Britain's asbestos fatalities had been exposed to Canadian asbestos, the people in Manchester were appalled at the thought that the lives of millions of people in developing countries would be endangered by Canadian asbestos for generations to come. "No more Canadian Asbestos. Aren't our dead enough." 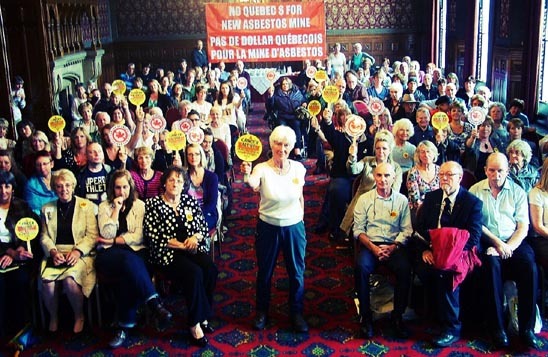 Quebec's financial involvement with the new asbestos mine was unanimously deplored by the participants at the AMD meeting in Liverpool Town Hall. Condemnation of Canada's continuing support for the asbestos industry and the country's double standards on asbestos  a substance it is happy to export but refuses to use  was a recurrent theme at meetings in Tayside, Glasgow, Aberdeen, Newcastle, Runcorn, Birmingham, Southampton, Leicester, Leeds, Plymouth, Rotherham and London. Reinforcing the pervasive disgust this topic engendered were the buttons designed and produced by UK campaigning groups that were proudly worn at AMD meetings. The wording on the striking yellow background was concise and to the point: Cancer Alert! 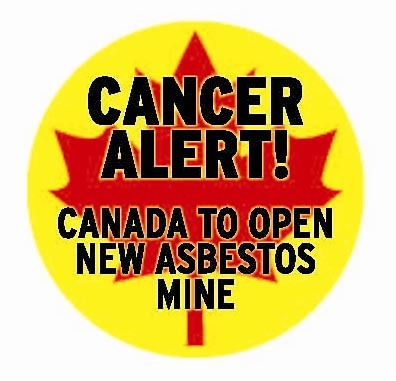 Canada to open new asbestos mine. The production of these badges was facilitated by the International Ban Asbestos Secretariat (IBAS), the June Hancock Mesothelioma Research Fund and the Mick Knighton Mesothelioma Research Fund, organizations dedicated to confronting Britain's asbestos tragedy and taking action to prevent others from experiencing the deadly consequences of asbestos exposure. 1 Groups meeting in Liverpool, Manchester and Southampton reported record numbers of people attending the 2012 events; attendance figures will be updated as more information becomes available. 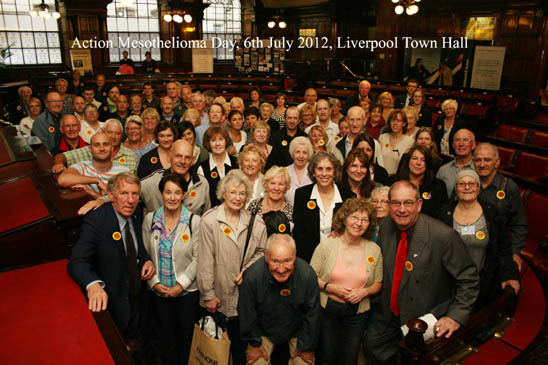 2 IBAS blog, July 8, 2012: Confronting Merseyside's Asbestos Legacy. 4 Asbestos victims are remembered. July 7, 2012. 5 Kazan-Allen L. New Asbestos Mine in Quebec. June 30, 2012. 7 Kazan-Allen L. Reprieve for Mesothelioma Victims. Issue 86, British Asbestos Newsletter. Spring 2012.